I hate treating my acne. But, this is a method that has worked well for me. These have been the best acne products for me. It’s quick and fairly low maintenance. For me, the treatment I about to describe is the Best Acne Treatment for Men. And, it is definitely being written from the perspective of a man. But, I really don’t see why this couldn’t also be used for women. First let me say that I don’t have any medical background. Most of what I’ve learned is from research over the internet. And, from talking with friends who have made different suggestions. And, lots and lots of trial and error! USE ANY OF THIS INFORMATION AT YOUR OWN RISK!!! Anything I’m talking about below is only my personal experiences. Your skin type and your reaction to any of these “treatments” may be completely different. And, could cause permanent damage. So, if you can’t own what might happen to you by following anything below, please stop reading and close this web page. Also, DON’T READ ON if you are sensitive to graphic details. Acne isn’t pretty. So, some of what I’m going to talk about might make some folks uncomfortable. When I was young I had severe cystic acne. The acne got so bad that I eventually turned to Accutane. My parents were Christian Scientists. So, they refused to help me with paying for it. But, I took my earnings from my summer job and made the purchase. I was 18 years old and fresh out of high school. My summer job earnings were consumed with this treatment. But, my acne was THAT bad! My decision to do something came one day when I had multiple 1 inch diameter pimples on my chest. There was one specific day that pushed me over the edge and made me decide to pay for the Accutane treatment myself. I warned you above about graphic descriptions. But, how I finally decided to get the Accutane treatment is even too graphic to share. So, I’ll save you the details. Anyway, that was the day I decided something had to be done. So, I got the Accutane treatment and my acne got much better. I still wasn’t cured. But, the GIANT pimples have been a thing of the past. I still get some large painful ones every once in a while. But, nothing like the ones I had pre-Accutane. Now, I usually get my worst pimples (the large cystic ones) when I eat bad food. I’ve noticed that foods high in carbs tend to set my skin off. Rice is something I often see direct correlations with. And, it’s difficult because I’m a huge fan of various forms of rice (in Chinese food especially). Over the years I’ve tried the many over the counter Best Acne Treatment for Men regimens. Some of them worked intermittently. Most of them didn’t work reliably. And, until the last 10 years, my treatments were always “reactionary” treatments. Meaning, wait for the pimple and then treat it. About 10 years ago I found that low grade prescription medicine could be used to treat my acne. At that time, my doctor prescribed me with minocycline (here is an article that gives a little background). I first started with Solodyn (a slow release version of minocycline). This worked very well with intermittent periods of failure (few and far between). But, I was happy enough with the results to have continued with it. But, then my prescription company that I have to use through my work stepped in and basically told me that I would have to pay for Solodyn in full if I wanted to continue using it. The cost was something like $1200. So, I had to move to the generic minocycline. The generic at first didn’t work well at all. But, was much less consistent than the Solodyn. I even went back to doing nothing medicine-wise for a while (my parents would be so proud). I eventually came back to the minocycline and later it worked well for me. When it wasn’t working well for me, it was usually because I was eating poorly. And, the poor eating was overriding the medicine. Over the years, I’ve learned that bad eating can pretty much override any Best Acne Treatment for Men that I try. Although, I can’t say I’ve done the “Three 1/2 Prong” approach below on a daily basis to see if it can overcome bad eating. I suspect it might. But, I’m too lazy to give that much of a try. After using these “minocycline” based meds for maybe 5 years, I talked to a family member that mentioned that minocycline could cause lupus like symptoms. See this article here that talks about this. I have a fairly active workout regimen that sometimes includes lifting weights, riding a stationary bike, and playing racquetball and sometimes basketball. After doing many of these activities, I would feel very sore and have many joint pains. It turns out that “joint pain” is one of the symptoms for lupus. So, after hearing that, I decided I needed to give up the “minocycline” type of meds. I also did some testing by going off the meds, and then back on to look for differences in my joint pain. And, I really do believe I was seeing differences (meaning I was experiencing less joint pain when off the minocycline). My tests were for 3 months at a time. I felt that was enough to know if the meds were truly affecting my joint pain. My conclusion was that for me: it was. So, out with the minocycline. With minocycline out of the mix, I needed to find something else. After some research online, I found a couple of alternatives. I’ve used each of the alternatives with some degrees of success. I unfortunately get too lazy to proactively use any of these Best Acne Treatment for Men regimens. But, when I do, I always seem to get positive results. I actively use all of these as all of them provide help for various type of pimples. Each of these treatments can be used independently (although the “Three 1/2 Prong” lotion/cream treatment is really the one Best Acne Treatment for Men on it’s own; not three treatments; or four if you include the 1/2). After reading online, I found the following heat treatment device. 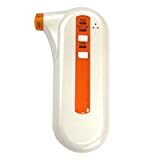 The SKINRAY Micro Electron Ance Removal Tool device is very good at treating certain types of pimples. It works well on the non-cystic types of pimples. It can sometimes eliminate those types of pimples and blackheads in hours. In fact, for some very minor pimples, this Best Acne Treatment for Men (I don’t see a woman trusting this heat treatment) can eliminate the pimple by the time the treatment is over (I think it’s two or three minutes). I always find that amazing that it’s gone that fast. Sometimes the pimple appears to be gone, but is actually just spread out under the skin and comes back in a couple more minutes. But, sometimes it is just gone! FOLLOW THE DIRECTIONS FOR HOW TO USE THIS DEVICE!! I’ve read online about using this too many times in the same place causing skin discoloration. Or, otherwise damaging your skin. So, use this product at your own risk! This Best Acne Treatment for Men is hit or miss on the larger cystic types of pimples. When it does help, it’s just not easily recognizable as progress because the pimple is so big. I suppose it could be preventing even more growth. But, I have had some larger pimples that this just doesn’t seem to help. For me, the “Three 1/2 Prong” treatment and a spot treatment of 10% Benzoyl Peroxide makes the best progress. What I really like about this “heat treatment” is if I’m having a bad breakout, it can provide quick relief. So, if a pimple is causing pressure under the skin, sometimes it provides some relief in that pressure. Not always. But, enough that I just keep coming back to it. The SKINRAY product is the heat treatment that I use. I started with a different brand. And, it may have worked better. But, it was limited to something like 60 treatments. Then,it would stop working (part of the design of the product). I then found the Skinray product. This product (sometimes also called “Skinray”; product number is SK-0804) advertised 300 uses. So far, I really think I’ve used it over 1,000 times. And, it hasn’t stopped yet. If you are going to just do one of any of these treatments, for me this is the Best Acne Treatment for Men you can choose . After getting off the minocycline treatment I was looking for a quick fix replacement to the minocycline. After a lot of research I found a few instances on the internet where Zinc was helping some folks. Here is an article that talks about the possible benefits of Zinc. 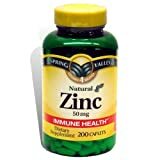 For me, I have been taking 50mg of Zinc for about 3 years. And, I do believe I see a difference when I’m on the Zinc versus when I’m not. I’ve taken at least three “flavors” (different brands) of Zinc. And, I do think I see differences between the brands. Also, the Zinc isn’t powerful enough (at least in the doses I use) to overcome a big plate of carbs for dinner. So, if I’m not eating right, I do still get pimples. And, sometimes I will still big cystic painful pimples (although not as big as before the Accutane). But, I’m not getting them as often. With my “Three 1/2 Prong” approach, I can usually get back to clear in a couple of days. Whereas before, one pimple could turn into three, or a continuous series of pimples that could last for weeks. Spring Valley Zinc is one of the brands of Zinc that has worked well for me. Although, I suspect any 50mg treatment can provide similar results. I still to this day use this Best Acne Treatment for Men is one that I still take daily. I recently had Carpal Tunnel surgery, and decided to stop taking all meds for about 1 month. My face was not handling it well. So, I do still think the Zinc helps me with my acne. When I have eaten poorly and have had a breakout, I then will fall back on this “Three 1/2 Prong” cream/lotion approach. If I wasn’t so lazy, and I did this once a day, I really think I would have clear skin most of the time. When I do this Best Acne Treatment for Men, I can truly feel the lotions and creams working. In fact, as I’m writing this, I had a monster zit growing on the right edge of my nose yesterday. Using this treatment (I’ve did it once yesterday before bed; once this morning; and once this evening). The difference is amazing. Here are the steps to this 3 (and 1/2) step approach. It only takes about 5 minutes (yes, I’m that lazy when it comes to this). So, don’t be scared away by how many steps it takes. Each step really only takes between 30 seconds and 2 minutes depending on how much skin you are trying to treat. For me, the area of my face where men usually grow a goatee is where I have the most trouble. So, using this approach in that area, I can easily be done in 3 minutes. The first step is to clean your face with a mild soap. 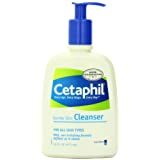 The recommendation I found when researching was to use Cetaphil Gentle Skin Cleanser For All Skin Type. This soap is to be used directly on the region on your face that is having problems. Again, this is step 1. Don’t wash your face first with water. Or, do something else to “prep”. I put a squirt or two depending on how much area I’m cleaning. And, I use my fingers to rub the soap into my skin. I usually only do this for about 15 seconds. After I feel like I’ve scrubbed off any oil that was on my face, I take a towel (or sometimes kleenex or tissue paper) and wipe the soap off my face. Again, do NOT use water to remove the soap. Just wipe the soap off with a towel. 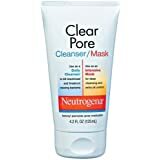 The second step is to apply Neutrogena Clear Pore Cleanser/Mask onto the region on your face that is having problems. This cream will dry up on your face in seconds. If my breakout is worse than usual, I’ll leave this cream on for a little longer (up to a minute or even two). If the breakout is mild I might just put the cream on and removed it after about 10-15 seconds. When, I’m done letting this cream dry, I go to step 3. So, don’t wash the cream off. Just go to step three now. BTW, you may start to feel the cream work as you let it dry. It kind of causes a little tingly feeling. The third step is to remove the cream put onto your face using a moisturizing lotion. So, at the start of step 3, you have your drying Neutrogena Clear Pore cream still on your face. Now take a squirt or two of moisturizer lotion and rub it over the Clear Pore cream rubbing it off with your fingers. In the end, you will have a mixture of Clear Pore and moisturizer all over you face. I usually spend about 15 – 20 seconds rubbing of the Clear Pore with the moisturizer. After you feel like you’ve rubbed off all of the Clear Pore, use a towel to wipe the lotion/cream mixture off of your face. WARNING: The Clear Pore contains benzoyl peroxide. Benzoyl peroxide can sometimes act as a bleaching agent. So, be sure you use a white towel. Or, a towel you don’t care about coming out of the laundry all splotchy. 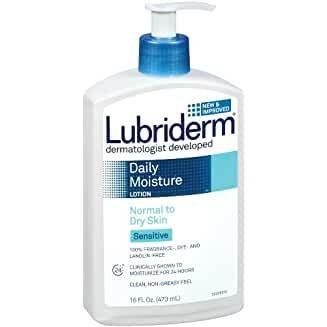 I personally use Lubriderm Sensitive Skin Therapy For Sensitive Dry Skin (this link is for a case of 12 of these, so I wouldn’t use this link unless you’re buying for several people; I couldn’t find where this “For Sensitive Dry Skin” version was sold for just one). Here is a link to Lubriderm Sensitive Skin Therapy For Normal to Dry Skin. I suspect it will work just fine for this step. Just as I suspect any of 100’s of moisturizers will work for this step. The idea for this step is that you don’t want to leave your skin dry and flaky. Dry skin is your enemy. If you have dry skin, that means dead skin cells. These dry dead skin cells can block your pores and cause pimples. This part is optional (hence the 1/2). I will sometimes skip this step if I’m not trying to attack one of the “monster” pimples. If I have one of the big cystic pimples, I will use the step to directly attack that pimple. So, this step is typically only used (by me) for spot treating a specific pimple. Not for treating an entire area. At least that’s how I implement this step. So, for this step I’ll use a 10% benzoyl peroxide cream. There are many out there. I use the 10% because my skin can handle it. Some skin types are too sensitive to 10% and may have to use a lower percentage. I’ve never seen a product with more than 10%. The product I typically use is called Acne Treatment. It is the Walmart Equate brand. And, is 10% benzoyl peroxide. No water is needed for this Best Acne Treatment for Men (and, should NOT be used on your skin; you can use water to wash off the excess lotion, mask and cream from your fingers). A dry face towel is pretty much all that is used to remove the creams/lotions (and only on steps 1 and 3). Remember that the ingredients in the #2 lotion includes chemicals that work like bleach. So, if you use a “nice” hand towel, you may ruin it with the chemicals from that product. So, be sure to use a towel you don’t care about for this procedure. Or, use tissues or kleenex instead. For me, this Best Acne Treatment for Men regimen works wonders. When I wipe off the combined lotion/cream in step #3, I can feel a tingle in my skin that really makes be believe its already working. For pimples that have gotten out of hand, the addition of the benzoyl peroxide after the last step can really target that painful pimple and most of the time produce dramatic results by the next morning. I’m not saying a really big one will be completely gone. But, most of the time, the painful pressure is reduced to just what you might have from a minor pimple. So, for me this is absolutely the Best Acne Treatment for Men (and women).